6. Tying the Head to the Staple. 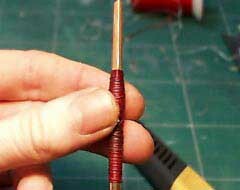 Align the head to the staple and push it up to the 30 mm line. 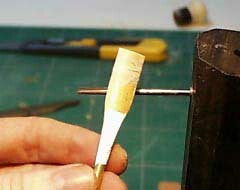 The distance between the eye of the staple and the tip of the reed is important because it tunes the back D and it also has some effect on the tuning of the second octave. 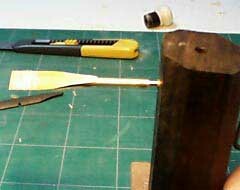 If your back D is always flat push the staple a little further then the 30 mm mark ( try steps of 1 mm at the time). Place it on the winder. 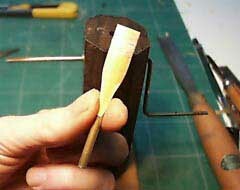 You don't really need a winder but if you make a lot of reeds it will make the process of tying the head to the staple a lot faster and you'll have much more control. 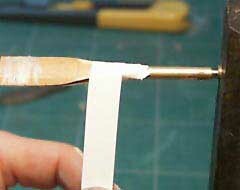 Take some PTFE tape and wrap up to the 30 mm marker. 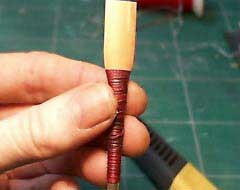 This makes the reed really airtight and helps to keep the head in place when you do the final binding. Use some kind of twine and wax it. I use red nylon because it stretch a little. 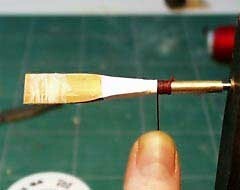 Release the tension when you come near the 30 mm line. The 'blank' is ready. It's best to leave it alone for a few days so that the cane can get used to its new existents. I never have the patience for this, but maybe you have. 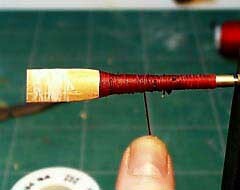 Check if the sides are closed if not use a piece of wax and rubbed it along the sides.